Evoking the deep blue of the night sky, lapis lazuli has enchanted civilizations since ancient times. This stone, mined in the most inaccessible reaches of Afghanistan, is used for jewelry, inlay and carvings. If you are interested in buying lapis lazuli, you might have noticed that Lapis lazuli is widely available, therefore even on a budget, you can purchase high-quality stones. In this post, we will provide you with some tips on how to buy lapis lazuli, based on our personal experience. Its signature bold, blue color can make a striking accent as well as a feature stone in a jewelry piece. Best of all, lapis lazuli is quite affordable. However, in today’s market, buying gems is not an easy business. The counterfeiting of gems sky-rocked in recent years and with increase of e-commerce popularity, this issue appears to be quite pressing. So, what can you do to insure the purchase of real, high-quality lapis lazuli for reasonable price? Lapis lazuli is one of the oldest of all gems, with a history stretching back some 7000 years or more. This mineral is important not just as a gem, but also as a pigment, for ultramarine is produced from crushed lapis lazuli (this is why old paintings using ultramarine for their blue pigments never fade). If you want to learn more about this amazing pigment, visit our post on Ultramarine Blue. Nowadays to buy a gem so coveted since ancient times, you should consider factors like color, luster, clarity and other characteristics like origin, and state of the gem. Color is the main determining factor that determines the value of Lapis Lazuli. A deep, intense, blue with violet tones would be at the apex. Fine grained, uniform specimens can attain a smooth, highly polished surface not seen in lower grades. Calcite inclusions almost always lower the value, but pyrite inclusions enhance it in the minds of many collectors and jewelry lovers. Polish quality and faceting artistry also affect value. The most expensive lapis show an evenly distributed color and have no visible deposits of calcite, although a moderate amount of gold pyrite flecks is considered acceptable. Too much pyrite can result in a dull, greenish tint, while calcite can predominate the mix, giving the stone an overall less appealing lighter blue shade. Luster and clarity are other determining factors to determine the value of Lapis Lazuli, as well as the cut or shape. Lapis is primarily considered a matte stone, but when it is polished it has a slight luster. A debate exists between lapis collectors on how much pyrite is ideal. Most agree on that the less calcite the better the stone. Calcite can be seen as streaks or patches within the darker blue or can predominate in the mix, giving the rock an overall lighter blue shade. However, it´s not surprising that a stone whose popularity has extended across continents and millennia can reach new markets. Denim and country-western clothing have opened a niche for what once was considered low-quality, virtually unsalable material from Chile. Cleverly dubbed “denim lapis” is now sold widely. Although many people associate lapis with dark blue, it’s also found in other blue shades, and even other hues. Its color can range from deep violet blue and royal blue to light blue to turquoise blue to a greenish blue. The combination of different minerals in the aggregate determines the color. For example, the presence of lazurite produces lapis lazuli’s prized royal blue color, while a mineral called afghanite creates a pale blue shade. A gemstone’s appearance might be described using an adjective that refers to a country or region, but that doesn’t necessarily mean the gem is actually from that area. Thus, lapis with a lot of white calcite spots and many green patches might be sold as “Chilean”, but this doesn’t mean it’s really from Chile. Other characteristics are crucial too when you are buying your Lapis Lazuli like origin, enhancements, precautions and state in which the gem is. 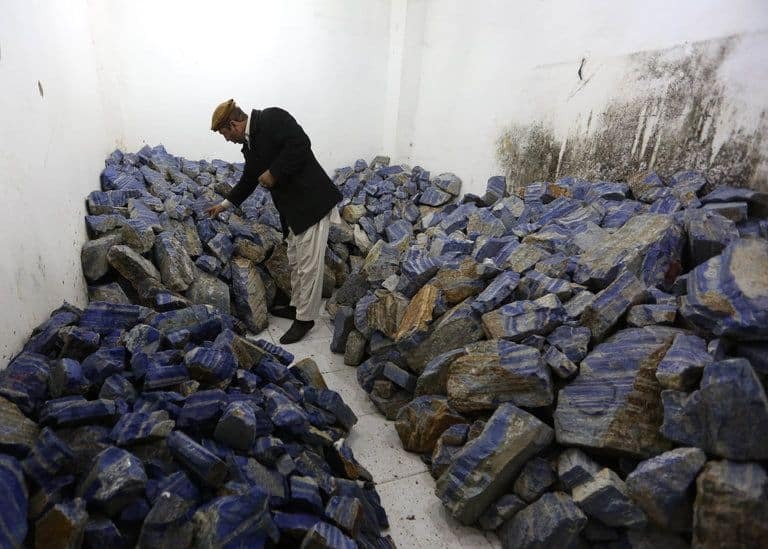 First mine to produce this blue colored beauty is in Afghanistan. The mine had huge deposits and offered superior quality gemstone for many years. It still continues to give the high quality gems. Little less superior quality gemstones are procured from the mines at Chile, Siberia, United States, Burma and Canada. Other countries like Russia, Italy, Mongolia and Pakistan also produce this gemstone but in less quantity. Inferior qualities of Lapis Lazuli produced by few countries are enhanced with the use of modern technology. It is mostly dyed or stained in order to improve the intensity and the uniformity of color. Buyers need to be careful from buying the imitations at the price of genuine stone. Glass and plastics in different forms colored in blue are sold as original stones. Synthetic stones are also available in the market. Buying these synthetic stones is no harm but buyers should be aware of the fact that these are very cheap. Analyzing the data on prices provided by traders and other sources is complicated by the lack of clear or consistent definitions of the different grades. It making it difficult to work out which prices are comparable, although broad categories are distinguishable. Traders are sometimes vague, and not all of them seem to think strictly in terms of grades. They also appear to sometimes classify Junduk lapis separately from 1 to 10. Sometimes as grade 8-10 on a scale where high quality lapis (known in Afghanistan as “Mahdani”, literally mine lapis) is classified as grades 1-4. A separate system also exists, classifying lapis from C (lowest) to AAA (and unofficially up to AAAA). Grade 1 or the highest has a price of up to $2000 per kilo. Grade 2 or High has a price of $1,050 ($o.21/carat) per kilo. First Quality Lapis has a price of $300 per kilo. Grade 3 and 1 has a price of $102-$153 per kilo. Grades 10 and 12 have a price of $50 and $10 per kilo respectively. In the today market there are hundreds of places where you can find lapis but like we’ve said before, always be careful and always buy your lapis in trustworthy places like our favorite Nammu.com store. Here you can find exquisite Lapis lazuli gems like earrings, pendants, necklaces, stones, and bracelets at the best price. They have free shipping and the best customer care. They give special attention to stores. Jewelry made and brought directly from the Afghan mines. We hope these tips can help you find a fantastic blue gem. Always try to buy this beautiful gem in known places.